You are currently browsing the archives for the October Rally Report category. Stevens Point Rally a Big Success! 100 people of all walks of life and religious affiliation took time out of a beautiful sunny Saturday to attend the Stand Up for Religious Freedom Rally Saturday, October 20 in Stevens Point, WI. Posted in October Rally Report | Comments Off on Stevens Point Rally a Big Success! Rally Captains all across the country have been reporting in with their attendance numbers, and with 140 cities tallied, the headcount for the October 20 Stand Up Rally has hit 28,077! Stay tuned to this blog post for updated numbers as reports come in. Here’s the city-by-city tally. If you have numbers for a Rally city not listed here, please let me know in the comments. How fortunate we are to be here in PA and to have the main bridge into Reading named after William Penn, who founded “Penn’s Woods” for the purpose of religious freedom. 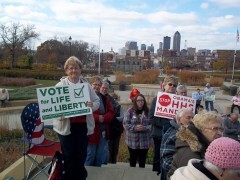 Our rally on Sat., the 20th was a lively event as we stood on the bridge with signs, banners and flags. 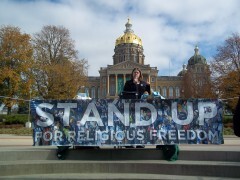 The large Stand Up for Religious Freedom banner was highly visible. About 80 people attended the event. Tags: Penn Street Bridge. The name is a reminder of the historical importance of religous freedom in America. Seattle: An Awesome Protest March and Rally! In Seattle, rain is ever-present. Our summer, for instance, may start the day AFTER 4th of July. This year, summer arrived in early August. So Seattle rally organizers were not surprised by weather reports early last week threatening 60% chance of rain for Saturday. But come time for Saturday’s rally, temperatures were cold, but the skies revealed big patches of blue with no precipitation in sight and, this, just in time for over 200 people to step-off on the .8-mile, pre-rally protest march from St. James Cathedral to the steps of the US District Courthouse. Posted in October Rally Report | Comments Off on Seattle: An Awesome Protest March and Rally! Huntsville, Alabama Rally Captain Kelley Manley delivered an open letter to President Obama about the HHS Mandate at the start of their October 20 Rally. As a woman, feminist, single mother, founder of Huntsville Right to Life, and a veteran, Kelley points out how the Affordable Care Act and the HHS Mandate aren’t just bad policy, they’re horribly bad for women! Check out Kelley’s great letter in the video above or read it here [PDF]. After 2 dreary, rainy days in Iowa, the clouds parted and the sun came out, as if on cue, for the Stand Up for Freedom Rally in Des Moines on the steps of the Iowa State Capitol. The crowd of about 120 were met with enthusiasm from pro-life student group speakers from Iowa State and Simpson colleges. Jenifer Bowen, Iowa Right to Life, read a statement from Governor Branstad and Lt. Governor Kim Reynolds that they would always stand with us in protecting and promoting the religious freedoms of all people. 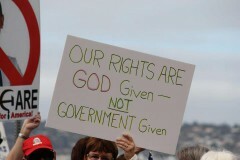 Stand Up for the unborn, for those living with regret, for the wounded, for the Truth! Local candidates for both House and Senate addressed the crowd and urged everyone to exercise their freedom and vote their values. The clarion call for those in attendance came from Monsignor Frank Chiodo who reminded us of our heritage and the cost for religious freedom. Everyone enjoyed the weather and the speeches and most mingled around long after the rally talking with the speakers. Nearly 1000 believers of religious freedom rallied in the rain at the October 20 Stand Up For Religious Freedom rally in San Diego. Appreciative honks, waves, and thumbs from passers-by on Las Vegas Bouldevard birightened the smiles of people lining the street with the Stand Up For Relgious Freedom signs. Las Vegas is a city where it is very easy to find talented speakers and singers. 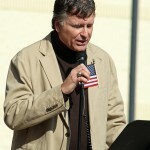 Ann Arbor Stand Up For Religious Freedom Rally Draws 375 Hardy Souls! More than 375 hardy souls rallied for their Religious Freedom at the Ann Arbor Stand Up For Religious Freedom Rally, held on Saturday, Oct. 20th at Concordia University despite the cold temperature and the threat of more rain, as part of the nationwide rally which took place in over 140 communities in the United States. Following a pre-rally prayer service and short March to the Rally Site lead by the Knights of Columbus Color Corp, the enthusiastic crowd was welcomed by Professor Charles Schulz of Concordia University, who also serves as pastor of St Thomas Lutheran Church in Ann Arbor. 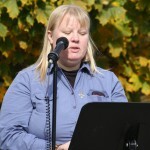 Posted in October Rally Report | Comments Off on Ann Arbor Stand Up For Religious Freedom Rally Draws 375 Hardy Souls! The third “Stand Up for Religious Freedom” rally on the steps of the New Jersey Statehouse, took place on Saturday, October 20, 2012. Organized by Marie Tasy, the Executive Director of New Jersey Right to Life, this gathering was one of hundreds simultaneously gathering in cities across the country. The day began with Holy Mass at the Cathedral of St. Mary of the Assumption at 10:30. Pastor Msgr. Joseph Roldan concelebrated Mass with Fr. Dan Swift, of St. Benedict Church in Holmdel, Fr. Van Hager, a Consolata Father who resides in Somerset, and Fr. Jay Bowden, who is retired of the Diocese of Trenton.